This recipe can be used as a healthy, clean, alternative to the normal full fat cream cheesecake. You won’t even be able to tell the difference from the original, dairy version. The main ingredients are nuts, dates, coconut oil, agave and lemon. A slice of absolute heaven as it’s nutrient dense, satisfying, nourishing and extremely tasty. Step 1: For the base layer – In a food processor, add all of the ingredients and pulse until a sticky balls forms. Transfer into a cake tin with some parchment paper and press down to form a crust. Put in the freezer to let it set. Place all of the ingredients into the food processor except the water and blend to a creamy smooth consistency. Add water only if necessary to make it creamier and blend better. Place over the ready made crust and put back in the freezer for a couple of hours. Once the first 2 layers are set and ready you can finally make the last layer. Simply add all of the ingredients except the chia, 50g of strawberries and coconut shreds to a blender or food processor and blend until smooth. Add the water if needed to help become smooth. 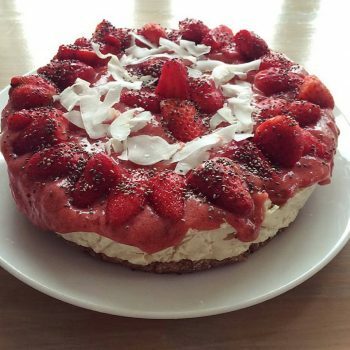 Once done, simply add to the top of the cake, sprinkle coconut shreds, chia seeds and halved strawberries to top and let it sit for another 30 mins in the fridge and enjoy!